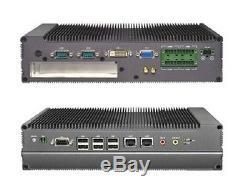 Fanless Embedded System with Intel Atom 1.6 GHz CPU. VGA, DVI, CF Socket and wireless comm antenna holes, PCI-E (x1) Slot. The LEC-5011 is a fanless embedded system. Designed for intelligent industrial and commercial. Interfaces including dual mini-PCIe interfaces. For wireless modules, and an onboard Intel®. Atom embedded processor for exceptional. Performance with very low heat generation. And minimal cooling requirements, resulting in improved stability and. Longevity, and providing a higher return on investment. To provide even more flexibility, Lanners engineers have built the case of. Tough aluminum with heat dispersing fins to whisk away heat from the. Processor and allow the system to operate in harsh environments. Intel® Atom 1.6 GHz onboard CPU. 1 Mini-PCIe for WiFi Module. 1 Mini-PCIe slot for 3G/GPS module. 65mm height industrial case with heat dispersing fins. 20°C to 60°C operating temperature. Supports up to 2GB DDR2 memory. USB x 6, COM x 4. PCI or PCIe x 1 expansion slot. CompactFlash Type I/II or SATA HDD support. Intel® Atom 1.6 GHz. AMIBIOS with 8Mbit BIOS Flash. RS-232/422/485 x 2 (COM 2 & 3). Mic In / Line Out. 1 for 3G or GSM/GPRS module. Mini-PCIe x 1 (with USB Signal). Mini-PCIe x 1 (USB signal only). PCI x 1 (LEC-5011P only). PCIe (x1) x 1 (LEC-5011E only). Linux kernel 2.4.16 or above. XPE/Win XP-32 bit, Win CE 6.0. The item "LANNER LEC-5011 Industrial embedded PC" is in sale since Wednesday, June 8, 2016. This item is in the category "Informática y tablets\Ordenadores de sobremesa\PCs de sobremesa y todo en uno". The seller is "qnvsolutions" and is located in Sant Joan Despí, Cataluña. This item can be shipped worldwide.